William Bates, was born in Dublin on 2 October 18822, the eldest son of Herbert & Mary Elizabeth (née Wiley) Bates. His parents had married at Beeston Parish Church on 26 December 1891 but had gone to live in Ireland soon afterwards, before returning to Beeston in about 1895. By 1901, the family was living at 58 Middle Street, Beeston and Herbert had found work at the Humber cycle works as a fitter3. By 1911, the family - now including eleven surviving children - was living at 87 Mona Street, Beeston4. Herbert was not with the family. William, now 19, was working as a threader at a lace factory. His sisters Mary Ellen and Edith Emily were working as cotton winders, his brother Herbert was a joiner, and his brother Albert had just started work as a draper's errand boy. His younger siblings, Benjamin, Walter, Harold and Nora were attending school and Clarice, the youngest, was just one-year-old. Later in 1911, on 2 September, William enlisted for continuous service with the Royal Marine Artillery, Marines that were attached to Royal Navy ships to man guns and to take part in boarding parties and small-scale landings. After initial training, he joined HMS Natal as a Gunner, on 2 December 1912 5. 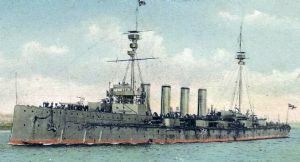 HMS Natal (shown right) was the second of four armoured cruisers in the 1903–04 naval construction programme. She was laid down on 6 January 1904 at Barrow-in-Furness by Vickers, Sons & Maxim and was christened on 30 September 1905 by the Duchess of Devonshire and completed on 5 March 1907, joining the 5th Cruiser Squadron. Her main armament was six 9.2-inch guns in turrets facing fore and aft, supported by four 7.5-inch guns in turrets positioned amidships. Three 18-inch torpedo tubes were distributed fore and aft6. In 1908 HMS Natal escorted the Royal yacht on the occasion of the visit of the King and Queen of Sweden and, 1911-12, she escorted the P&O liner Medina when she carried King George V to India to attend the Delhi Durbar. Gunner Bates would have joined HMS Natal on her return to England and would have been part of the ship's complement when she carried the body of the US Ambassador to Great Britain, Whitelaw Read, back to New York in December 1912. During this voyage, she sustained damage in heavy weather and afterwards returned to Chatham for repairs and her annual refit. At the outbreak of war, she joined the Grand Fleet and in January 1915 was refitted at Cromarty. Gunner Bates was promoted to Bombardier in January 1915. HMS Natal spent much of 1915 uneventfully patrolling the North Sea until she began a brief refit at the Birkenhead shipyard of Cammell Laird on 22 November. On 5 December the ship rejoined the 2nd Cruiser Squadron at Scapa Flow and, twelve days later sailed with the squadron to Cromarty Firth, then a major naval base in northern Scotland. On 30 December 1915, Captain Eric Back was hosting a film party on board the Natal and had invited the wives and children of his officers, one civilian friend and his family7, and nurses from the nearby hospital ship Drina to attend. A total of seven women, one civilian male, and three children were in attendance that afternoon when, shortly after 15:25 and without warning, a series of violent explosions tore through the rear part of the ship and she capsized and sank almost immediately. Early thoughts were that she had been torpedoed by a German U-boat or had detonated a submarine-laid mine, but later examination of the wreckage showed that the explosions were internal, probably originating in the rear 9.2 inch shellroom or the 3-pounder and small arms magazine. An Admiralty court-martial as to the cause concluded that it arose from an internal ammunition explosion, possibly due to faulty cordite8. Bombardier Bates was amongst those who died in the explosion, one of a total of 421, including all the women and children on board. Survivors numbered about 400, about 100 of whom had been ashore at the time, taking part in a football match between sailors and soldiers. The remains of her wreck are designated as a protected place under the Protection of Military Remains Act 1986 as a war grave and it remains the last resting place of most of the casualties, including Bombardier Bates, whose body was never recovered9. 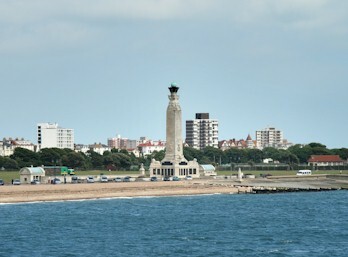 He is remembered on the Portsmouth Naval Memorial. There is a memorial to all those who lost their lives in the HMS Natal disaster, beside the lifeboat station at Invergordon, where there is also a garden, opened in 2000, called Natal Gardens. 2His birth was registered in Dublin South Registration District in Q4/1892 - Ref 2 235. His exact birth date is recorded in his enlistment record and the Royal Navy & Royal Marine War Graves Roll. 7Understood to be the family of John Henry Dods from Evanton, Ross-shire. 8The full story of the loss and that of similar tragedies, are told in the book 'They called it an Accident' by A Cecil Hampshire - published by William Kimber of London, 1961 (Not seen).